Nigeria-based Homeland Integrated Offshore Services has ordered two additional Fast Crew Supplier (FCS) 3307 patrol vessels from the Damen Group, a year after it received the second FCS 3307, the company announced on 17 March. The vessels will be named as Guardian 3 and Guardian 4. 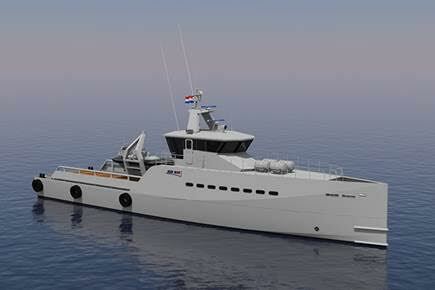 The Damen Group will take care of delivery and crew training, as well as the design and build of the vessels. The two new Guardians will be used to carry out security patrols for the production companies and occasional transfers of crew and supplies. The 33m vessels will be designed to match the technical requirements of the production companies. The vessels have a top speed of 30 knots, which is five knots faster than the specification. The vessels will be equipped with 18 bunks for crew and security personnel, who can remain on board for up to four weeks. The wheelhouse is a bullet-proof and additional equipment includes 15 seats for crew transfers, thermal imaging, a diesel powered SOLAS fast rescue craft and an additional fuel separator to protect the engines and generators from contaminated fuel.